dare! Sour Cherry Pie for Horizon Shine Cafe?? I'll check with the chef. Longtime Field & Stream contributor Bill Heavey has become the magazine's most popular voice by writing for sportsmen with more enthusiasm than skill. 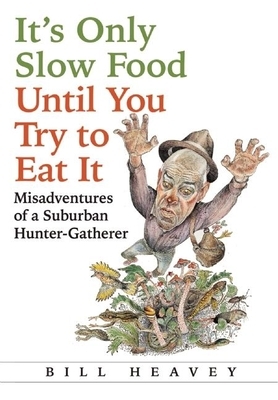 In his first full-length book, Heavey chronicles his attempts to "eat wild," seeing how much of his own food he can hunt, fish, grow, and forage. But Heavey is not your typical hunter-gatherer. Living inside the D.C. Beltway, and a single dad to a twelve-year-old daughter with an aversion to "nature food," he's almost completely ignorant of gardening and foraging. Incensed at the squirrels destroying his tomatoes, he is driven to rodent murder--by arrow. Along the way, Heavey is guided by a number of unlikely teachers, from the eccentric Paula, who runs an under-the-table bait business, to Michelle, an attractive single mom unselfconsciously devoted to eating locally. To the delight of his readers and the embarrassment of his daughter, he suffers blood loss, humiliation, and learns, as he puts it, that "'edible' is not to be confused with 'tasty.'" Bill Heavey is an editor-at-large for Field & Stream, where he has written since 1993. His work has appeared in numerous publications including Men's Journal, Outside, the Washington Post, The Los Angeles Times, The New York Times Magazine, and Best American Magazine Writing.